In theory, Google Shopping is simple. You upload your products to a feed through Google Merchant Center, connect it with Adwords and voila, your product images and price will start to populate on Google’s search results. If you are an entrepreneur looking to get started on Google Shopping, Adwards has a video tutorial that walks you through setting up a campaign in under 5 minutes. Just so you have a visual representation of how Google Shopping works, below you can see how a product from your website will populate via an image after someone conducts a Google Search for the product name. If you have the right Google Shopping strategy, this can be a lucrative way to grow ecommerce sales. The issue with Google Shopping is that you lack control, which means you can spend a lot of money without being profitable (unless you follow the hacks below). With Google PPC, you bid on keywords and your advertisements will only populate if people search for those specific keywords. I wrote an article on Single Keyword Ad Groups (SKAG) that details how controlled you can get with Google PPC. Google Shopping pulls in product information from the title of your product along with information on your website, so there are much more search terms that can drive people to your site. Sometimes this can be good; other times, not so good. Related: Are You Taking Advantage of Google's Local Inventory Ads? Here are six hacks that can save you money on your Google Shopping while boosting your profitability. Make sure your product titles are strategically selected and the content on the product pages of your website is well optimized. If you are selling a product from a manufacturer, you’ll want to make sure the title is consistent with what the manufacturer has listed since this will likely be what people search and convert for. If you have your own brand, it is beneficial to select titles that have keywords with good search volume so people can actually stumble on your product via Google Shopping. Having unique content on each product page is an important way to differentiate your brand. If you just copy and paste the same content as a manufacturer or competitor, you could be looking at duplicate content isssues. Google is going to crawl the content on your product pages, so optimize each product page with search terms that can convert. However, even if you optimize the title and content on each product page, you’ll still drive traffic to your website that won’t convert, which is why the next step on negative keywords is so important. I can’t overemphasize how important it is to add negative keywords into each one of your Google Shopping campaigns. This can drastically save you money and increase your performance. 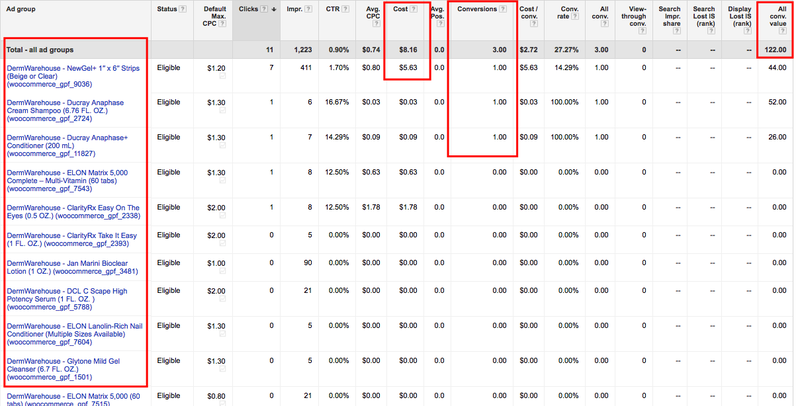 Within your Google Shopping campaign, you’ll want to click on “keywords” and then “search terms” and then segment by "clicks" to see which search terms are eating up the majority of your budget (see below). DermWarehouse, an ecommerce skin care brand, was nice enough to allow us to share campaign data for this Entrepreneur article so readers could get a better understanding of the examples we're referring to. Google is trying its hardest to drive people to your site based on keywords on each product page. This doesn’t mean the traffic it is driving to your site will convert. DermWarehouse sells a popular and trendy brand name Juara. Juara has several products that contain coffee ingredients. Above in the "search terms" report, you can see DermWarehouse converts on keywords pertaining to the brand name Juara (look at the conversions tab). When people searches for just “coffee lotion” they do not convert well. This is an opportunity to add the exact variation of “coffee lotion” as a negative keyword. If you are having trouble grasping why the search term “coffee lotion” wouldn’t convert for this skincare company, think of how broad of a search term this is. Juara is much more specific, meaning people are deeper into the purchasing funnel when searching for this brand on Google. “Coffee lotion” is more likely an initial search people are typing in, meaning it won’t be as likely to convert. Can these more generalized keywords such as "coffee lotion" convert? Absolutely! You have to keep a close eye on your shopping campaigns to monitor what’s converting and pause the poor performers by adding them as a negative keyword. Anytime we see a search term that has over 30 clicks without a conversion, we either lower the bid or add the search term as a negative keyword. One of the biggest mistakes we see among ecommerce brands is they upload all of their products into one Google Shopping feed and it is a massive free-for-all. Sticking with the skin care example, Glytone is a much more popular brand than Juara. This means there are more search terms for Glytone products compared to Juara. If you have one campaign with a $100 daily budget, Glytone would likely eat up 90 percent of the daily budget. Even though Juara isn't as popular, since it is more niche, it could convert three times higher, which is why it is so important to segment your Google Shopping campaigns. You want all of your products to have a chance to prove whether or not they are profitable for your company. Price of product: $10-$29, $30-$49, $50-69, etc. Brands: Juara, Glytone, ClarityRX, Alphaeon, etc. Below is an example of campaign segmentation for the top 30 selling products for DermWarehouse. In order to find the top selling products, there was prior segmentation based off of each brand. You can see the day I took the screen shot below, DermWarehouse spent $8.16 on this specific Shopping campaign and generated three conversions for $122 in revenue. This is a 14.95x return on advertising spend. While there wasn't a lot of money spent at the time of this screen shot, you can see how past data is being used to make Google Shopping work smarter so the campaign is profitable. In the example above, you can see how there are different bids (default max CPC bids) for each product. You want to make sure you are bidding strategically based on the price of the product along with your profit margin. We recommend taking the price of the product and dividing this by your profit margin. If you have a $100 product and your margins are 50 percent (after all expenses), then you are looking at $50 profit. According to SmartInsights, the standard ecommerce conversion rate percentage is 3.78 percent on desktop devices; on mobile devices, it is 1.14 percent (more on mobile bidding to come). You'd want to take $50 and multiply this by .038 to get a $1.90 bid. This is a good starting point! If you can convert above 3.78 percent on this $100 product, you'd be profitable. Too often, ecommerce businesses will have the same bid for each product despite a drastic difference in pricing. This is a major flaw that can hold back your profitability on Google Shopping. Any digital markter is going to tell you about the importance of mobile. The issue is that mobile has an ecommerce conversion rate of 1.14 percent, less than half of desktop. Most advertisers don't realize that you can reduce your mobile bid adjustment, which will make your Google Shopping campaigns more profitable. If you go to "settings" and "devices" you have the option to reduce mobile bidding. In the example below, you can see the mobile bid adjustment has been reduced by 50 percent. This has dropped the average cost per click by more than 50 percent on mobile. This is making our budget work harder on desktop, where all of the conversions have come from. While we don't want to give up on mobile completely within this campaign, we know it isn't as profitable as desktop and tablet, hence the 50 percent bid reduction. I mentioned earlier that the standard ecommerce conversion rate percentage is 3.78 percent on desktop and 1.14 percent on desktop. This means that 97 out of 100 people who are visiting your website are not converting! Make sure you have retargeting set up so after someone drops off your site your branded advertisement will continue to be served for up to 30 days. There are advanced features of retargeting called dynamic search retargeting and RLSA (retargeting lists for search ads). For starters, make sure to create your first display retargeting campaign so your brand will stay top of mind to people who drop off your site.